Earlier in the week, my friend Rodney Wilts of Theia Partners sent me a JLL report called, World Cities: Mapping the Pathways to Success. I am admittedly only getting around to it now. The Real Estate Highlights that accompany each category of city is a good place to start if you’re looking to do a quick scan of the report. One-quarter of all capital invested in commercial real estate globally currently lands in one of the “Big Seven” cities. And London and New York are easily at the top. Cities that recently graduated from “New World City” status – namely Toronto, San Francisco, Sydney, and Amsterdam – are all struggling to address housing and infrastructure deficits. 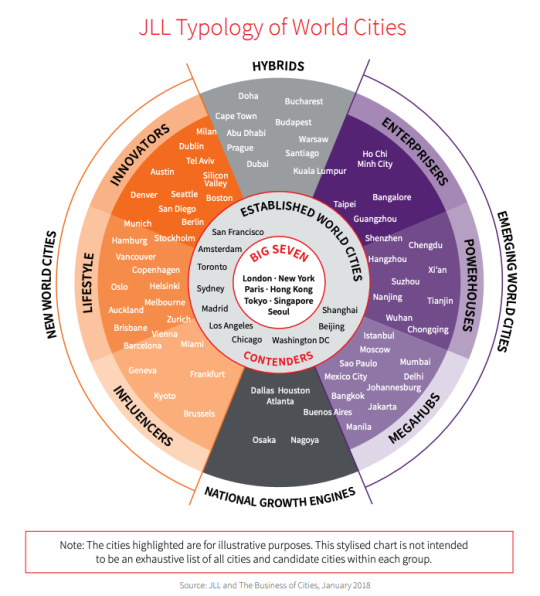 “Lifestyle” cities – such as Vancouver, Auckland, and Oslo – are some of the most active investment markets. Biggest rental growth for prime offices (since 2000) in the “New World Cities” category.